You read stories about puzzle-centric cleverness all the time, whether it’s a real-life treasure hunt or saving Christmas through cryptography. But tales of puzzleriffic romance? Those are far more rare. So when I was reminded of a particular bit of romantic wordplay fun, I couldn’t wait to share it with my fellow puzzlefiends. C and G are one of those brilliantly matched couples that makes you smile just thinking of them. Marvelously compatible interests and senses of humor and general weirdness that makes relationships worthwhile. G had several gifts picked out for C, but he wanted to surprise her with a little something extra, a bit of diabolical sweetness only a true puzzle devotee would love. So, before C received each small token of affection, she was given a cryptic crossword (also known as a British-style crossword) clue to solve. Cryptic crossword clues involve both cunning wordplay and a definition. The number after the clue provides the number of letters in the answer word. Here are the clues G created. Hopefully you can figure out the answers just as C did! Plus, there’s an added bonus: the four five-letter answers, when placed in order, form a phrase. As it turns out, not only is romance NOT dead, but it’s far more clever than you may have expected. 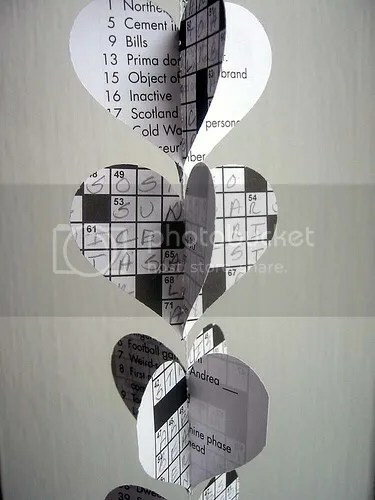 This entry was posted in Puzzles and tagged Cluing, DIY puzzling, Geeking Out, Holidays, Puzzle romance, Puzzle to solve, Puzzlin' fool by gmdirect. Bookmark the permalink.